We are offering Cross Wheel Wrench to our client. 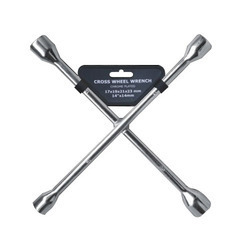 We are offering Cross Wrenches to our clients. Made from selected carbon steel sockets hardened chrome plated. Being one of the renowned organizations in the industry, we are providing our clients with a unique range of Cross Wrench. We bring CROSS SPANNER which is manufactured using optimum quality carbon steel obtained from trusted vendors and is chrome plated. Well known for its sturdy construction, it is functionally competent too. Suitable for TATA(msrtc)Suitable for TATA(msrtc). Backed by a team of adroit professionals, we are manufacturing an extensive array of Four Way Wheel Spanner. 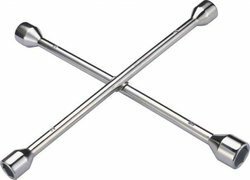 Aimed at a prosperous growth in this domain, we are instrumental in offering an excellent quality range of Cross Spanner. We offer a wide range of Valve Wheel Wrench. They are heavy duty Valve Wheel Wrench that are especially used in the different engineering industries. We offer these in different size and shapes and also customize as per the specifications of the customers. We provide high grade Cross RIm Wrenches which are popular for high quality and precision.